The Shield of Faith is a pretty straight forward part of the armor, isn’t it? Your faith protects you from the attacks of the enemy. But the question to ask is, faith in what? Believe it or not, some Christians have faith in the wrong thing. There are three types of faith I’ve seen Christians have: faith in their religion, faith in their faith, and faith in Jesus. Faith in a religion is faith in a belief system. A faith in a theology that, without Christ, is always flawed. What I’ve seen this type of faith do is cause division among Christians in the church. A few examples is that some Christians believe Christian metal, or Christian horror, is an oxymoron, while others believe it’s just another type of music or genre used to give glory to God. I’m not going to point out who’s right and wrong because that will contradict what this post is about, but debating such trivial things like that is leaning more towards a faith in a belief system, and since the two view points contradict, it can only lead to division which is one of the enemy’s biggest weapons against Christians. The other type of faith Christians can have is faith in their faith. This is what a lot of pastors call, the “Name it and Claim it” faith. It’s more material focused than the other types, and only leads to independence, which of course will lead to disappointment and emptiness. Our own will is the object of this type of faith, and really, what do we know about what we need? The last type of faith is faith in Christ. This is the faith Christians need. Like I said before, the enemy wants to cause division and strife within the church, and we’re open targets because we all think we have the answers in our correct beliefs. We can’t see the flaming arrows the enemy is shooting. 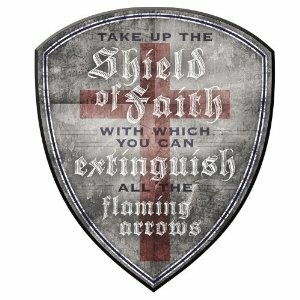 Faith in a belief system isn’t fireproof, faith in your faith isn’t fireproof, only faith in Christ can withstand the enemy’s attacks. And when we pour our faith and trust in Christ, His Holy Spirit will begin His work in us, and He’ll lead us into all truth. He’ll deliver us from the lies of the devil. A soldier puts all his faith in his shield for his protection. It’s time we fixed our eyes on, and put our trust in, the object of our faith: Jesus Christ. Our mighty shield.